I spotted this moth in the orchard this morning. 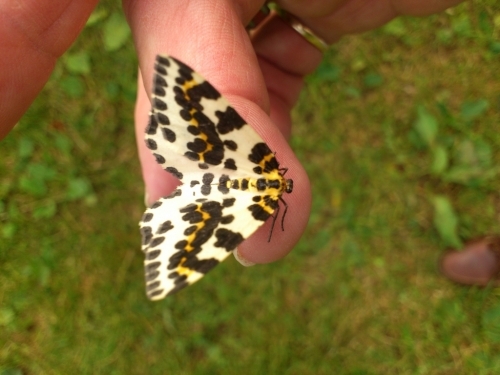 Its a Magpie Moth Abraxas grossulariata. The colours are striking and quite rich upon close inspection. Apparently it was once considered a pest but is now no longer plentiful and in some areas extinct. So that's a moment of excitement to start the day with. It sat dutifully on my finger while I took its photo, then fluttered off. I went back with a better camera, but couldn't find it. Perhaps it's in a bird by now - a magpie, perhaps? If only the bird knew what I know!